Crater. © 2003 Torsten Bronger. 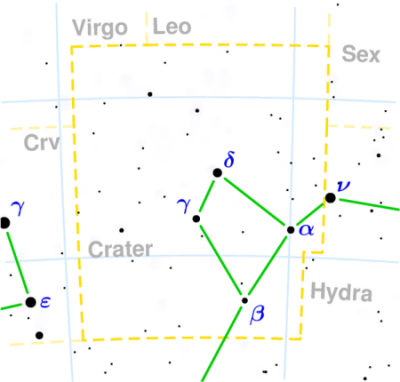 Crater (abbreviation: Crt), the Cup, is a small, faint southern constellation that lies next to Hydra. Its only star above fourth magnitude is Delta Crt (visual magnitude 3.56, absolute magnitude -0.32, spectral type K0III, distance 195 light-years).